Two agencies reported drops of up to 6 per cent in the Shams development – including the Gate and Sun & Sky towers – on Reem as new housing came online and expatriates left because of government spending cuts. But residents say landlords are lifting rents, knowing tenants would rather stay than have to pay thousands of dirhams in agency fees for new homes. 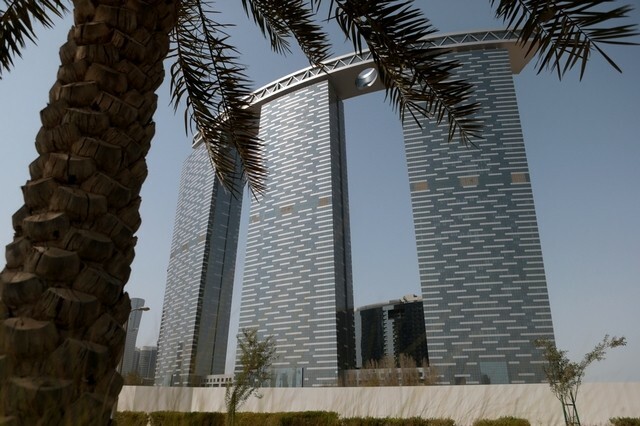 After his salary was cut amid slumping oil prices, Samir Afalli said he would probably have to move as he could not afford the 5 per cent rise for his two-bedroom Gate Towers flat, which would make it Dh150,000 a year. With his lease running out next month, Mr Afalli said that he dreaded having to move and find a new home during the holy month. “I have a wife and daughter, and will have to move to a place where I can afford a maximum rent Dh120,000, including fees, in the middle of Ramadan and summer,” he said. Another Gate Towers tenant said the rent on his two-bedroom flat rose by 2 per cent to Dh155,000 a year. That is well above rates quoted by a sales agent at property management firm Khidmah, who said similar units were available for Dh130,000 to Dh150,000. Property agency Asteco said that in the first three months of the year, rents fell by 6 per cent at Gate Towers and Marina Square in the first three months of this year, and 5 per cent at Sun & Sky Towers. The numbers reflected extra supply after the opening of towers including The Wave and buildings in City of Lights neighbourhood, said Ben Crompton, managing director of Crompton Partners, whose firm reported similar figures. “Over the past six months, about four or five new towers have been released and a huge number of units in Gate Towers owned by a government entity,” Mr Crompton said. But David Dudley, who runs the Abu Dhabi office for property consultancy JLL, said that conditions on Reem indicated “relatively tight vacancy rates”. “We have seen rents decrease in some parts of Reem Island,” Mr Dudley said. “However, with tight vacancy in high-quality schemes, some landlords are still able to maintain the same rent, with tenants having to accept this due to the additional costs and hassle of moving. British expat Keith Sinclair, 64, said he was shocked when his landlord asked for a Dh5,000 increase on his two-bedroom apartment in Beach Towers – a 3 per cent rise to Dh160,000. Another tenant at Arc Tower, which is adjacent to Gate Towers, said she was being asked to pay 4 per cent more for her studio flat. “With word that the rents are going down, to have a 4 per cent increase is ludicrous,” she said.